Published: Nov. 22, 2012 at 11:28 p.m. Updated: Nov. 23, 2012 at 01:23 a.m.
Dallas Cowboys owner Jerry Jones wears his emotions on his sleeves after games, win or lose. The appropriate emotion after Thursday's 38-31 loss to the Washington Redskins was humbled. 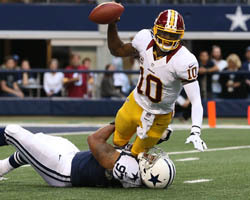 Take a look at photos from the Thanksgiving Day matchup between the Redskins and Cowboys. "It looks like our best opportunity would be to end up with the best record in the NFC East," Jones said, via The Star-Telegram. "I don't know what that's going to be. I don't know if 8-8 will get it there or not, and I sure don't know if we're going to be 8-8. "I'm not trying to be negative, but we've got to play these guys again. With how impressed I am with how they played, we've got our hands full up there for the last ball game." Oh my. The Cowboys are 5-6, and Jones isn't sure if the team can make it to 8-8. He's saying he's in awe of RG3. That's not the bombastic, confident Jones we know. This guy is a little sad. Jones was asked if coach Jason Garrett was making any progress. "That would be real difficult right now, because you would have to point to things like comebacks, and that's hollow when you are not winning the game," Jones said. "Or last week we win one, and we have to come back to win it, but we don't win it playing well. So that's hollow right now." This is a hollow-sounding owner. The Cowboys aren't out of it at 5-6, but they haven't shown anything to indicate they are ready to go on a winning streak. Jones knows it.